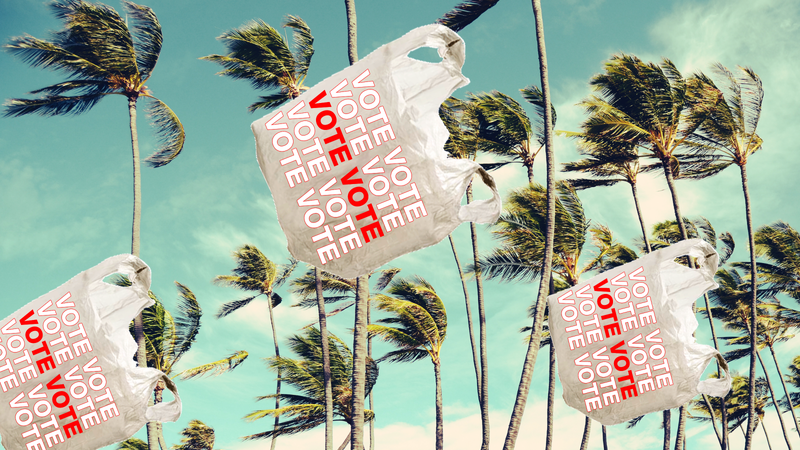 Don't waste your vote: Is California about to become the first state to ban plastic bags? On November 8, Californians will vote to put a statewide ban on one of the most ubiquitous consumer items in the world: plastic bags. Governor Jerry Brown's initial attempt to enact the nation’s first statewide ban was put on hold last year when the American Progressive Bag Alliance (APBA)—a trade group representing the plastic industry—collected enough signatures to qualify the policy for the November 8th ballot in California as Proposition 67. Currently, local bag bans represent about 40% of California’s population and will not be affected by the statewide policy, according to the Legislative Analyst’s Office. That remaining 60% represents a lot of plastic. Brown hopes that a statewide plastic bag ban could set a precedent for the rest of the U.S., which has fallen behind countless other nations—including China, India, Morocco and the European Union—that already have polices in place. Banning plastic bags from grocery checkout lines has become a popular way for communities to reduce litter that collects in city streets and coastlines, clogging waterways and threatening wildlife. Numerous communities across the United States have already implemented a ban, including 150 cities and counties within California alone. As an alternative, shoppers are encouraged to bring reusable bags from home or purchase a paper bag at the checkout line for a nominal fee, usually 5 or 10 cents. While the results of bans have been overwhelmingly positive, enacting the policy has shown to be somewhat difficult due to opposition from lobbying groups and a divide in the support of local officials. Other states, like New York, have had similar difficulties. Opponents of the ban, like New York City councilman David Greenfield, argue that the 10 cent fee puts a disproportional burden on the poor, who struggle to afford their grocery bills as is (the fee has since been lowered to 5 cents in NYC, though the ban is still under scrutiny). Supporters of the ban point out that low-income communities already pay for the bags in other ways, not all of which are financial; a stroll through the economically divided neighborhoods of Los Angeles or San Francisco quickly reveals which communities suffer most from litter. “Everybody has some sort of reusable bag laying around their house." 29-year-old photographer Rachel Bujalski lives on a small boat near Venice Beach in Los Angeles, in a marina that she said is constantly littered with trash. While she didn't single out plastic bags as the main source of litter, Bujalski and her boyfriend Brent think that the 10 cent bag fee is a good idea. “Everybody has some sort of reusable bag laying around their house, or can at least buy one from the thrift store for a dollar that can be reused 100 times,” said Brent. When asked about how the bag fee might affect the poor, Brent pointed out that taxpayers also pay a lot of money for city cleaning projects, which could be better directed elsewhere, like social services. A 2013 report by the Natural Resources Defense Council found that California communities are spending nearly $500 million each year on litter management to address trash build-up on city streets, beaches, rivers, and storm drains. While the California Grocers Association claims that the fee is used to cover costs, other cities have used the fee for environmental purposes. Washington's 5 cent bag fee is used as a clean-up fund for the Anacostia River, though critics argue the city has done a poor job at allocating these funds. There is actually another initiative on the California ballot, Proposition 65, that allows voters to decide whether to specifically direct fees associated with the plastic bag ban to environmental causes. In California, a lot of trash winds up on beaches or in the ocean, where animals mistake plastic bags for food and ingest them, or become entangled, often resulting in death. According to a 2007 study by the Worldwatch Institute, at least 267 marine wildlife species have suffered from the proliferation of marine debris, the biggest perpetrator being plastic. At the beginning of this year, a report from the World Economic Forum estimated that by 2050 there would be more plastic in our oceans than fish. The city of San Jose, CA, among the top five spenders on annual trash clean up in the state, reported that plastic bags are consistently one of the city's top five litter sources. San Jose adopted a plastic bag ban in 2011 in response to the city’s rampant litter problem, and has since seen staggering results. Jennie Loft, the Public Information Manager for San Jose’s Environmental Services Department, said that since implementing the ban, plastic bag litter has been reduced by 69% in storm drain systems, 76% in creeks in rivers, and 59% in streets and neighborhoods compared to pre-ban levels. The city has also seen the number of reusable bags used by customers increase to 48%, compared to 3.1% before the ban. Bag bans have had similar results all over California: Since Alameda County’s 2013 bag ban, the county has eliminated roughly 44% of plastic bags found in storm drains; San Francisco reported an 18% reduction of plastic bag street litter between the beginning of their ban in 2007 and 2009; both the city and county of Los Angeles, the state’s top spender on trash cleanup, implemented a ban in 2013 and successfully eliminated a third of the plastic waste running through their storm drain systems. Still, many critics argue that a switch from plastic to paper is an environmentally regressive move when accounting for carbon dioxide emissions from shipping and transportation. “They’re a thicker product…the same amount of plastic bags fit on one truck as it takes seven trucks to ship paper bags,” said APBA spokesperson Jon Berrier. Supporters of the bag ban say that criticism of paper misses the point. Steven Maviglio, spokesperson for the "Yes on 67 Protect the Plastic Bag Ban" campaign, said that a more common trend in areas where bag ordinances have gone into effect is the abandonment of single-use bags altogether, in favor of reusable bags. San Jose reported a 90% reduction in the average use of single-use bags in retail locations after the ban. Similar numbers have been reported in Alameda County, Los Angeles County, Mountain View, San Mateo County and Santa Barbara. While critics and researchers agree that assessing the effects of plastic bag bans can be complicated—particularly when factoring in the materials and processes involved in paper or reusable alternatives—experts and the overwhelming majority of environmental groups maintain that minimizing plastic consumption will, overall, be a good thing. While paper or reusable alternatives may pose dangers of their own, the explosion of plastic consumption in the past few decades has resulted in unprecedented amounts of human-made debris in our oceans, cities and even food. Rob is a freelance writer and journalist covering human interest stories, the environment and human rights.